James Douglass is bracing us to reimagine John F. Kennedy around the 50th anniversary of his “rendezvous with death.” He’s encouraging us to face what has seemed to me a central question — not so much the “Who Killed JFK?” bumper-sticker, but more “Why can’t we know?” The answer, Jim Douglas says, is “unspeakable.” He’s adopting a code-word that the late Trappist monk and author Thomas Merton applied to the eternal enemy, “the void,” darkness iself, “systematic evil that goes beyond the imagination.” Douglass’s “unspeakable” is the multifarious modern Satan which took the form of a movement in the upper reaches of Kennedy’s own national security state to kill the president as he made a radical and inspired turn toward peace. He has written a conspiracy book with a scholar’s footnotes and a theological subtext. And a robust Oliver Stone endorsement. Douglass’s JFK and the Unspeakable is a meticulous compilation of Kennedy and assassination studies. I came to it late, five years after publication, on the recommendation of friends sharing a precious secret. It’s a shocker that has the air, throughout, of a deeply serious inquiry. Jim Douglass has his own temperate, good-humored air. Born in Canada, he’s lived many years in Birmingham, Alabama as a Catholic Worker peace activist and soup-kitchen friend of the down-and-out, all the while teaching himself how to research and write history. The other axis of Douglass’s narrative is the secret apparatus of the national security state after World War 2. After the Bay of Pigs fiasco and the forced retirement of CIA chief Allen Dulles, Douglass pictures JFK at sword-points with his spies and special-operations team, also with famous hawks like General Curtis LeMay among the Joint Chiefs of Staff, dismayed that Kennedy hadn’t attacked the Russian bases in Cuba and itching, several of them, to launch a preemptive nuclear attack on the Soviet Union. It’s Douglass’ argument, with a lot of circumstantial evidence behind it, that well into 1963, the security chiefs dug in to protect their power and their worldview. Practiced and proficient in covert coups and “plausible deniability,” they snuffed out John Kennedy with masked forces and much the same sang froid they’d directed against Iran’s young democracy in 1953 and against Patrice Lumumba in the Congo in January, 1961, just days before JFK’s inauguration. “Who Killed JFK?” has always been the wrong question, James Douglass is telling us, because it comes to focus on the shooters. The question of what killed John Kennedy and why he was killed focuses instead on the evidence we have that the shooters are almost irrelevant. But the system is very relevant… The relation above all of JFK to his government is at the heart of it. The nature of the question will take us so far into what Thomas Merton called ‘the unspeakable’ that we’ll almost feel we’re lost in darkness as we’re seeing the light. 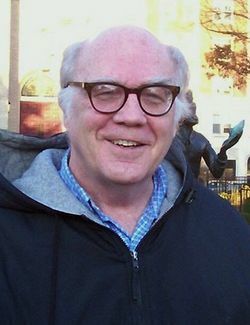 James Douglass in Birmingham with Chris Lydon in Boston, September, 2013. This is the second, not the last, of our Kennedy conversations on the 50th anniversary of his death, and there will be other angles of inquiry. But doesn’t it feel better to open with a writer who challenges so much received opinion and our deepest sentiments about the man and our government? I’ve always felt the CIA did it to start the Vietnam War and five years later they did it to Martin Luther King and RFK to keep it going. JFK is reported to have turned pale and ran out of a meeting after being told the CIA had just assassinated the corrupt president of South Vietnam after he had told them not to. The CIA’s assassination of Patrice Lumumba in the former Belgian Congo and the CIA-directed overthrow of the democratically-elected president of Iran in 1953 to protect BP’s oil contracts with the Shah of Iran, and the invasion of Iraq are more evidence that the U.S. was being run by secret intelligence agencies. This is a terrific interview. I’m anxious to listen to Part 2. 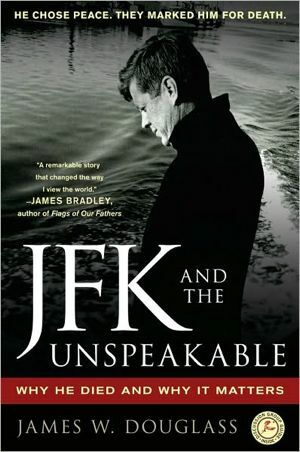 I’ve read James Douglass’ “JFK and the Unspeakable” and was deeply moved as well as disturbed by it, though not surprised by Douglass’ thoroughly researched account of Kennedy’s assassination. As you bring out in the interview, the key question isn’t who pulled the trigger or triggers, but, as in the subtitle of the book, WHY he died, and why it MATTERS. That is, what was JFK doing and saying that made him so “dangerous” in the eyes of his whole National Security apparatus that they felt they had to have him murdered? And what does what happened to JKF have to do with what’s going on today? For those who want to explore these questions in a broader context, both historically and now, there’s a play that’s just been written called “Project Unspeakable” that deals with all FOUR major assassinations of the 1960′s — of Malcolm X, Martin Luther King, Jr., and Robert Kennedy, as well as JFK — and that raises questions about similar cover and often criminal activities on the part of today’s National Security State. More information about “Project Unspeakable” is available at , including how people can organize a reading or performance of the play. Jim is a friend of mine for over 25 years. He is a man of the highest integrity. His research is infallible. Yes I read book right when it came out should reread as with anything good even if about bad which is what keeps many from facing the truth, that their God, if existing will be waiting for them, with me as nightwatchman from heel in heel as disciplinarian , funny how it makes them laugh but seldom worry as I remind them they can get their ” forgive me for i have sinned cards” missing, marksmen marks in archery at the same place the Culpable In Assassinations got their SS false id’s for the knoll-edge of cover up.Thank you, Sir. Yes, we must expose full truth to all.